She watched the dust motes dance in the sunbeam. Tiny planetoids swirling in their own macrocosmic universe, entropic and strangely peaceful. A small bright tongue of flame licked through the centre, charring the silent whirl. She sighed and glanced sideways. He was red this time, his scales burnished like a teachers' apple, polished and shined. Snout twisted in a smug smile, full of himself, tail twitching in amusement. She hated it when he did that, hiding in L space and then interrupting her right when she was about to… To do what exactly? She brushed the thought aside, settling her wings more comfortably. Then she pointedly ignored him flicking her ears dismissively. His chuckling purr rustled the pages under her and she huffed a smoke ring in his direction. Really, how childish! His long sinuous neck stretched out, and he caught her smoke ring on his snout like she'd sent him a kiss. Disturbed by the imagery she turned her head away, eyes whirling. A movement from the corner of her eye caught her attention, and she turned to look. Frowning she watched as the corner of a page was turned down, dog eared, creased. Incensed she cast paper-cut at the thoughtless Borrower and was rewarded with a curse and frantic digit sucking. He was right next to her now, sitting on her open page. She refused to move away, but he was too close so she tucked her wings in tighter. Her tail twitched with annoyance, tapping the page softly. More purring chuckles. He really was the limit! First open flame in a library, and now this! She closed her first eyelid and pretended to be resting. He nudged her side with his snout, hot breath on her soft scales. She let her colour drain away until she was a glassy greenish blue, deep ocean caught in doldrums. He'd snuggled right next to her, leaning his weight companionably against her side, his neck twining over hers. Resigned she tolerated it for a long moment before shifting uncomfortably. Pushing to her haunches she shook him off and launched herself off the edge of the book. Spiralling down, she let her wings catch, then a swoop and flap she soared higher, seeking her refuge. Spying the spine she settled herself on the top, perched gargoyle wise. ~Why always this one?~ His voice was amused curiosity. 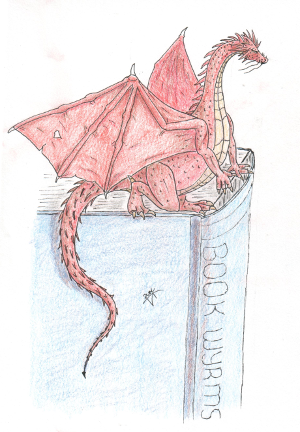 Predictably he'd followed her; sprawled nonchalantly across several tomes, tail hanging and wings carelessly splayed. She sniffed, and turned her neck down to read the words on the spine. Lovingly letting them flow across her tongue as she whispered them in her smoky sibilant voice. "Anne McCaffery Dragon Singer." Her heart swelled every time. He liked newer books, like Robin Hobb's City of Dragons, but she was a traditionalist, sticking with what she'd been hatched on. It was just one of the many things about him that irritated her right to the tip of her tail. He wriggled closer and looked at her imploringly, eyes a slow whirl. She looked away. Always with the story, once upon a time she'd believed he'd sought her out for her, but the truth was he just loved to hear her read. She sighed and settled her wings more comfortably, wrapping her tail around her hind legs. Unconsciously she knew she had taken on the pose of the great story teller, just like the statue. He'd moved again, wrapping himself doglike around her feet, his chin resting on her foreleg, eyes whirling up at her. ~Start from where Bilbo first sees him~ His tone was imploring. She closed both eyelids and brought the book into her minds eye, mentally flicking the pages until she reached the one she wanted. She cleared her throat and he quivered with pleasurable anticipation. She felt the tip of his tongue kiss her chin but did her best to ignore it. It was all just because of the story. She almost wished she'd never read it to him the first time, almost. Truthfully though, she was grateful he sought her out. Being the guardian of the Library was lonely at times, and he was amusing, if infuriatingly playful and childish. A thought occurred to her and she opened both sets of eyelids and peered down at him. He stretched his neck so his snout was closer to hers, his eyes whirling lazily. ~You stay, for me… you don't have your own Library, because of me?~ She could feel the double beat of her twin hearts all the way to the ends of her ears.